I was cooking this dish for a long time already and do not have a name for it. I tried this delicious dish in a Latin American themed restaurant before but totally forgot the name so since then I am preparing this dish which I don’t know how to call it. Now I am intrigued on what’s the real name of this dish as I will be posting it here at Ang Sarap so after I Googled the terms “pork hock and garbanzos” (garbanzos is a Spanish and Tagalog word for chickpeas) it immediately showed “Garbanzos con Patitas de Cerdo” as a result, I immediately switched to image view and certainly that was the dish I was tried before. The only difference I guess is that I am using pork hock (patas) rather than trotters (Patitas) hence the change in name. 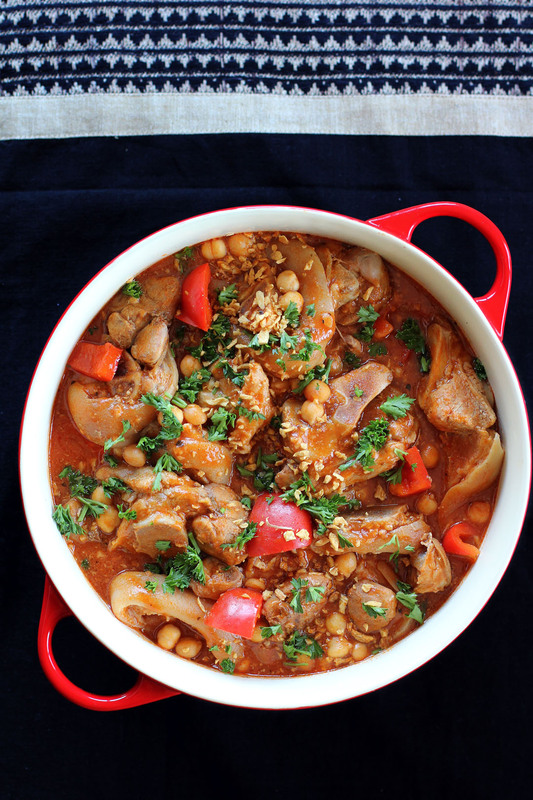 This Puerto Rican stew as the name suggest is a tomato based stew of Pork Leg and chick peas, some use potatoes and butternut to make it a complete meal. I guess this dish is a close relative to the Spanish Cocido and Callos where the cooking technique is nearly similar, where non premium meat parts or sometimes offal are simmered in low temperatures for a long time in a tomato based sauce. If you haven’t tried pork leg as an ingredient and is adventurous to try some then this is a good start as the flavours are so rich, the meat is really tender and the pork fat’s texture is nearly jelly like in consistency which will definitely make you feel guilty on every bite you have. Did it ever happened to you where you are cooking / serving something you don’t have a name for it? In a pot add oil then brown pork hock on all sides, add water and pork stock bring to a boil. Remove any scum that rises to the top then simmer for 45 minutes. In a food processor process sofrito ingredients together until it becomes a smooth paste, add a bit of olive oil if necessary. In a sauce pan add oil then sauté sofrito in medium heat for 3-5 minutes or until fragrant. Pour into the pot with pork hock together with the tomato paste, bring to a boil then simmer for 20 minutes, add water if necessary. Add butternut then continue to simmer for 20 minutes. Add chick peas and capsicum then continue to simmer for 5 more minutes. Season with salt and freshly ground black pepper, garnish with chopped parsley then serve. I may try this with a completely lean pork. Somehow though, if the meat does not have the fat, it is not as good. Again, this food looks amazing. I may have to look for a new adjective to describe your foods aside from good, amazing and delicious… Wow! will work for now. Youre correct it would not be as good this is because without this the soup would not be thick and collagen rich which is extracted from the pork skin with fat during the cooking process. I guess the best way to do this without fat is use the same part but trim off the fat once cooked. 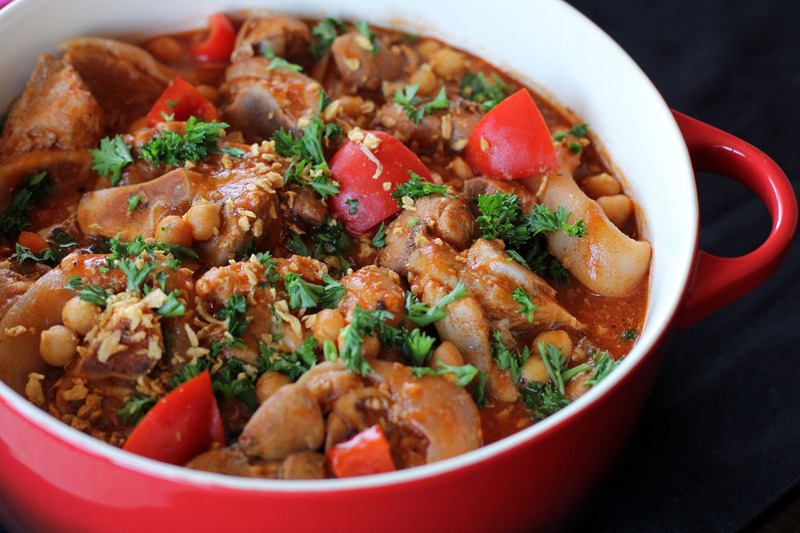 I love pork hock, but do not but it often because my husband do not eat…such an interesting recipe with chickpeas…looks delicious Raymund. Another beautifully hearty and warming dish. I’ve never used pork hock before, that’s a new one to me! Yummy! I can’t wait to try this one. Got to try that mofongo, do you have a good recipe for it? Those dishes without a name are usually the best and this one is no exception. Great list of ingredients and they all come together to make a fabulous meal! My kind of meal!